﻿﻿The Visual and the Verbal’, a skills-based training event for postgraduate students using material held at the Ruskin Library, Lancaster University on Wednesday 20th May. The Visual and the Verbal’, a skills-based training event for postgraduate students using material held at the Ruskin Library, Lancaster University on Wednesday 20th May. The Ruskin Library holds the largest collection of material relating to the life and work of John Ruskin (1819-1900), one of the most important cultural figures of his era in the English-speaking world. Among the most important manuscripts in the collection are 29 diary notebooks, covering the period 1835 to 1888, and c. 4000 manuscript letters. Also in the Library are over 1000 drawings by Ruskin, with others by his associates and pupils, and 125 plates from his collection of daguerreotypes, one of the most important collections of early photographs in the world dating from 1845-1858. 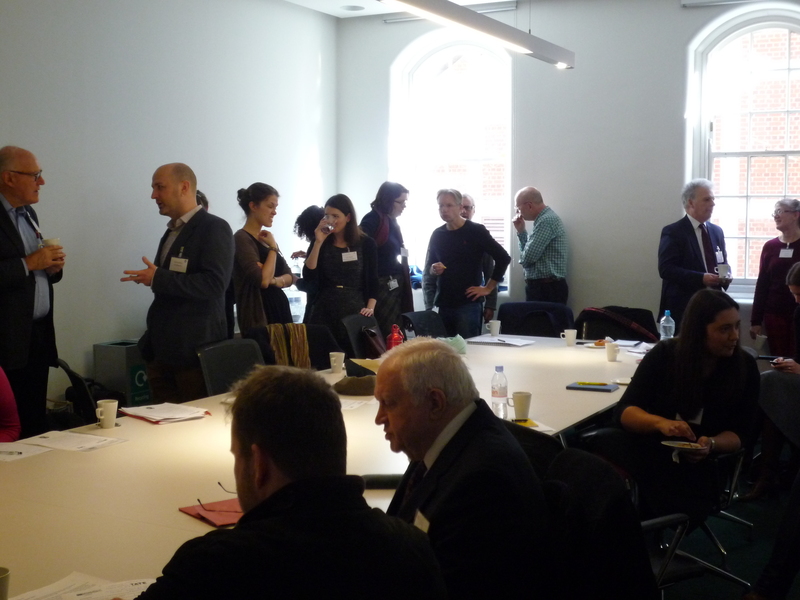 The strength of the archive lies in its breadth and depth, enabling research in a number of disciplines, and it will be used at our event to teach the research skills required for work with both manuscript and visual materials. Students working in English, History, Museum Studies, Visual Arts, Art History are welcome to apply for this event. The event will feature a combination of teaching methods, including intensive, practical hands-on sessions with Ruskin’s manuscripts. The event is being supported by the North West Doctoral Training Consortium. There are limited spaces but the training is open to both AHRC and non-AHRC funded students in the North West. Those nearing the end of their PhDs will be given preference (see below for details on how to apply). The students participating will be asked to prepare a five-minute presentation on their work in advance and to do some advanced reading. 10-11am: introductory seminar discussing what it means to do interdisciplinary research. 11am-12.30pm: students will give their presentations focusing on the ways in which their work is interdisciplinary and on their use of manuscript and/or visual sources. The postgraduate presentations will be filmed and made available on our website. 12.30pm-lunch: students will walk round the current Ruskin Library exhibition (Returned Triumphant: Loans to the Ottawa and Edinburgh exhibition ‘John Ruskin: Artist and Observer’). 2-3.30pm: there will be a hands-on session, where students will work with the full range of archive holdings held in the Ruskin Library, including Ruskin’s manuscript diaries, letters and notes to drawings, watercolours, engravings and photographs. We will teach skills of manuscript handling, palaeography, cataloguing, and discuss issues of transcription and editing. 4-5pm: there will be a workshop on approaches to the visual and verbal; this will focus on the nineteenth-century ‘ut pictura poesis’ debate (‘as in painting so in poetry’) and consider how we can attempt to approach the relationship between meaning in visual and verbal forms by means of analogy; semiotics or the concept of the ‘imagetext’. 5-6pm: there will be a practical session on the use of the notebook and forms of notation as research tools in the museum and archive. The workshop will offer guidance and examples of good practice of how to purposefully apply visual scrutiny, and students will draw from material held in the Ruskin collection. The teaching team, all from Lancaster University, will include: Professor Sally Bushell (English and Creative Writing), Dr Gerald Davies (Lancaster Institute for Contemporary Art), Dr Andrew Lacey (Senior Research Associate, Davy Letters Project), Professor Sharon Ruston (English and Creative Writing), Dr Andrew Tate (English and Creative Writing), Professor Stephen Wildman (Professor of the History of Art and Director of the Ruskin Library and Research Centre; also former Curator of Fine Art at Birmingham Museum and Art Gallery). Events are free and open to all, at 43 Gordon Square, London WC1H 0PD. Carol Jacobi and Hope Kingsley will be talking about the aesthetics and reception of salted paper prints in the nineteenth-century, and the experience of curating an exhibition of these rare early photographs in the twenty-first. For other events see the website. 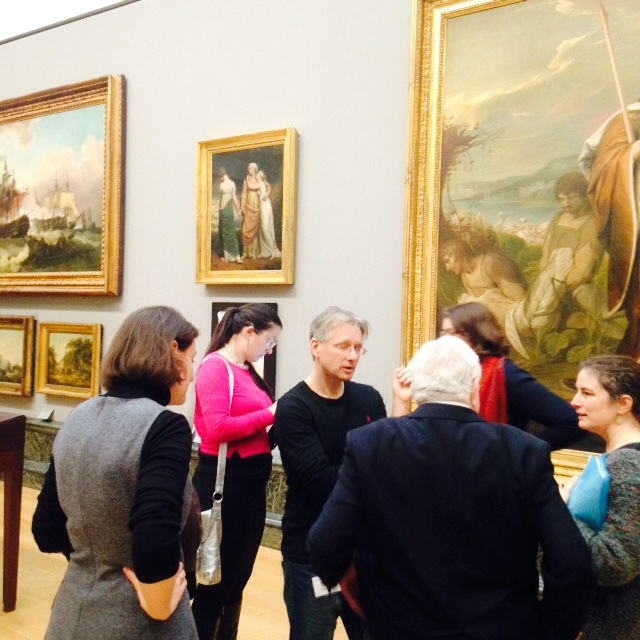 The third ‘Romantic Illustration Network’ symposium took place on Friday 27th February at the Tate Britain. Podcasts of the talks will be available on the website next week. This symposium brought together the authors of the key scholarship on the literary galleries of the Romantic period: Fred Burwick (The Boydell Shakespeare Gallery, 1996), Rosie Dias (Exhibiting Englishness, 2013), Ian Haywood (Romanticism and Caricature, 2013), Luisa Calé (‘Blake and the Literary Galleries’, 2008; Fuseli’s Milton Gallery 2006) and Martin Myrone (Gothic Nightmares, 2006; John Martin: Apocalypse, 2011) in a venue that is itself a form of literary gallery (Tate Britain) to present new research and to debate the relationship of painting to illustration, text, and print. To what extent did the literary galleries change the role of illustration in the Romantic period? RIN 3 attendees at the tea break, enjoying tea and pastries. Martin Myrone, Lead Curator in Pre-1800 British Art, welcomed everyone to the Tate, before we heard from our first speakers: Rosie Dias and Ian Haywood. Dias showed us how the location of Josiah Boydell’s shop on Cheapside and Shakespeare Gallery in Pall Mall fitted in to the cultural geography of 18th century London. She drew upon Luisa Calé’s work to demonstrate that at the Shakespeare gallery the textual and the visual – the catalogue of Shakespeare extracts and the paintings themselves – were presented as autonomous realms that could be separated or united at will, and that attendees could choose by their physical actions to be either readers or spectators. Ian Haywood gave a paper on Macklin’s shop the Poets’ Gallery and his exhibition and publication Gallery of British Poets. He presented a subversive close reading of the text and images published in 1794 in the fourth issue, at the height of the Terror in Paris. Luisa Calé gave a fascinating analysis of Maria Cosway’s ‘The Hours’ (the lead image on the RIN blog). After lunch all together in the Tate café, Fred Burwick gave a paper on tableaux vivants, which argued that the stage was a kind of literary gallery in the early nineteenth-century, as artists and dramatists recreated famous paintings on stage, and in some instances turned narrative paintings into plays. RIN 3 attendees in the Tate’s galleries, in front of Barry’s ‘Lear’. We were then treated to guided tours of the Print Room and the Galleries by Assistant Curators Désirée de Chair and Clare Barlow. We looked at prints by Blake and Fuseli, as well as illustrated pages from Bell’s British Poets and a print of Barry’s ‘Lear and Cordelia’. In the galleries, we heard about Fuseli’s ‘Lady Macbeth seizing the daggers’, as well as looking closely at Barry’s enormous finished oil painting of Lear and the dead Cordelia. After the presentation of the Bibliographical Society Studentship to Naomi Billingsley (Manchester) for her project on Blake and religious art, Martin Myrone spoke about gaps, misapprehensions, and questions of scale and authority in relation to the study of relationships between text and images, and between disciplines (such as literature, art history, book history, visual culture studies, theatre studies, etc). We rounded off the day with a discussion about the relationship between images, literature, and theatre, before heading to the White Swan for a companionable drink. The next symposium is on Saturday June 6th at the House of Illustration, and we are sure it will be as enjoyable and productive as this one! Keep an eye on the blog and the events page for details of the programme and registration.